The San Diego Chargers got off to a 6-1 start in the 2002 NFL season but then lost three of four before hosting the Denver Broncos on December 1. Coached by Marty Schottenheimer, the team featured RB LaDainian Tomlinson (pictured at right) on offense, already a star in his second year, and another second-year player, QB Drew Brees, had moved into the starting lineup with good results. Denver, under eighth-year Head Coach Mike Shanahan, was at 7-4 and had beaten the Chargers earlier in the season. 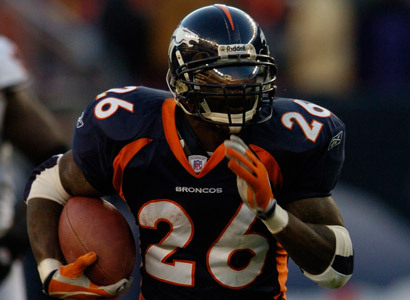 The Broncos had a star running back of their own in rookie Clinton Portis. But QB Brian Griese had been struggling with his consistency and 37-year-old backup Steve Beuerlein was starting. He had seasoned wide receivers to throw to in Rod Smith and Ed McCaffrey. There were 66,682 fans in attendance at Qualcomm Stadium. The teams traded punts until the Broncos put together a seven-play scoring drive midway through the first quarter. Beuerlein tossed back-to-back completions to Rod Smith for 23 and 13 yards and Jason Elam kicked a 54-yard field goal. The Chargers came back with a 56-yard possession, but following a third-down pass from Drew Brees to WR Eric Parker that picked up 30 yards to the Denver 24, San Diego could move no farther and Steve Christie’s 42-yard field goal attempt was unsuccessful. Denver wasted no time in scoring again as Beuerlein threw to Ed McCaffrey for 17 yards, Clinton Portis ran for 8, and on the third play of the series Portis carried again for a 43-yard touchdown run up the middle. The successful extra point made it 10-0 in favor of San Diego. However, now it was San Diego’s turn to strike quickly. On the first play following the kickoff, LaDainian Tomlinson took off around left end on a 76 yard run to the Denver six yard line. On the first play of the second quarter, Tomlinson rushed for a three-yard TD. Following a punt by the Broncos that put the Chargers in good field position, Tomlinson again set the tone with a 24-yard carry and four plays later he reached the end zone from a yard out. San Diego had the lead for the first time at 14-10. Denver turned the ball over on a fumble on its next series and once more it was Tomlinson scoring a touchdown to cap the ensuing possession, this time running in from five yards out. Down by 11 points, the Broncos struck fast as Beuerlein threw to McCaffrey for a 47-yard gain and, two plays later, Portis scored a touchdown on an eight-yard run. The Chargers put together another scoring drive prior to the end of the half. Brees completed four passes and, with ten seconds left on the clock at the Denver two yard line, Christie booted a 20-yard field goal. San Diego took a 24-17 lead into halftime. Denver started off the third quarter by driving to the tying score in ten plays. Portis rushed for 39 yards, including 18 on the first play, and caught a pass for 13. The series ended with Beuerlein tossing a 22-yard touchdown pass to RB Reuben Droughns and Elam added the extra point that made it 24-24. Neither team was able to score during the remainder of the period, but the fourth quarter started with CB Alex Molden intercepting a Beuerlein pass to give San Diego possession at the Denver 30. Four plays later Christie kicked a 40-yard field goal that again put the Chargers in the lead by 27-24. San Diego had a chance to add more points but Christie was wide on a 49-yard field goal attempt. Denver responded by driving to the Chargers’ seven yard line in 11 plays and Elam made good on a 24-yard field goal try that again knotted the score. That was how it stood at the end of regulation. The Broncos had the first possession in overtime but had to punt. In a series that included a 25-yard run by Tomlinson the Chargers advanced to the Denver 19 but Christie’s 38-yard field goal attempt was blocked by DE Trevor Pryce. Beuerlein threw to TE Dwayne Carswell for a 19-yard gain as Denver moved into San Diego territory, and this time Elam was unsuccessful on a long three-point try from 53 yards. Once again the Chargers drove into scoring position, with Tomlinson carrying the ball six times and Brees completing a pass to TE Stephen Alexander for 20 yards. With just over three minutes remaining in the extra period, Christie, who had a difficult day on field goal attempts, won the game with a 27-yard boot – his ninth career overtime field goal. San Diego ended up on top by a score of 30-27. The Chargers had the edge in both total yards (434 to 417) and first downs (25 to 20). They also sacked Steve Beuerlein four times and didn’t turn the ball over at all, while Denver did so three times. The Broncos also committed nine penalties to just one flag thrown on San Diego. 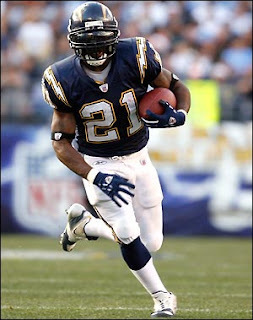 LaDainian Tomlinson had the biggest performance, rushing for 220 yards on 37 carries with three touchdowns. Tomlinson’s rushing total included 10 carries for 57 yards in overtime. He broke his own club record of 217, which he shared with Gary Anderson, and was well on pace to break the team’s season rushing record held by Natrone Means (Tomlinson would exceed his single-game and season rushing records in subsequent years). With 11 pass receptions for 51 more yards, he gained 271 yards of total offense. Drew Brees completed 27 of 41 passes for 217 yards with no touchdowns or interceptions. While Tomlinson was well ahead in leading the Chargers in pass receptions, his 51 receiving yards were three ahead of Eric Parker’s 48 on three catches. For the Broncos, Clinton Portis (pictured below) gained 159 yards on 23 carries and scored two TDs – a fine performance that was overshadowed by Tomlinson’s. Steve Beuerlein was successful on 22 of 39 throws for 288 yards with a touchdown and two interceptions. Ed McCaffrey topped the receivers with 7 catches for 126 yards. The overtime win improved San Diego’s record to 8-4, but they didn’t win again, losing four straight to close out the year at 8-8 and third in the AFC West. The Broncos recovered to win two of their last four games to place second in the division at 9-7, just missing the playoffs. LaDainian Tomlinson finished second in the league in rushing with 1683 yards on 372 carries (4.5 avg.) and 14 touchdowns. He also caught 79 passes for 489 yards and another TD. His 2172 total yards ranked fourth in the NFL and he was selected to the Pro Bowl for the first of an eventual five times.